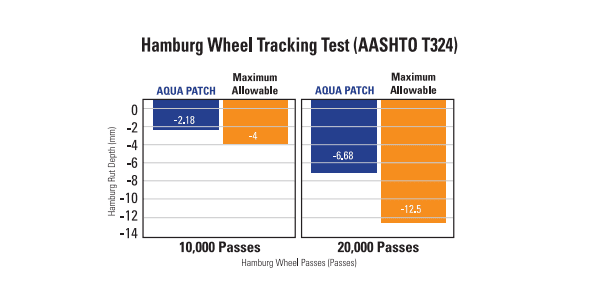 The Hamburg Wheel Tracking Test is used to evaluate the resistance to rutting and the moisture susceptibility of bituminous mixtures. A small loaded wheel device repeatedly rolls across a prepared asphalt mix specimen. The test terminates at either 12.5 mm of rutting per set, or at 20,000 total passes. 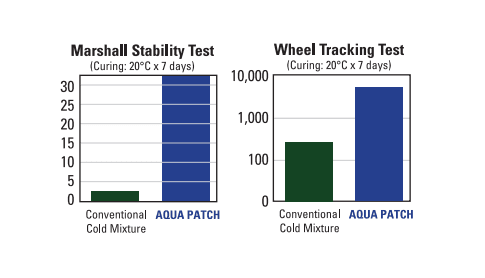 AQUA PATCH was tested in 50°C water under a moving 158 lb wheel load at 50 passes per minute. The above result shows that the rut depth after 10,000 cycles is -2.18, and -2.68 after 20,000 cycles. Both depths are lower than the maximum allowance that is defined by AASHTO (American Association of State Highway and Transportation Officials). The AQUA PATCH material performed well in the test.